PPE or 'Personal Protective Equipment' covers items such as gloves, goggles, helmets and aprons and relates to any item designed to protect the wearer's body (or clothing) from injury or infection. This document lists some of the most common pieces of PPE that you may use in schools, their uses and the hazards they protect you from. It is essential you always use the correct PPE when required and replace any faulty or damaged PPE as soon as the problem is noticed. Schools generally have Health and Safety budgets through which PPE can sometimes be purchased. Also someone in your school will be a Health and Safety rep and will be your first port of call when deciding what PPE you may need and how to use it correctly. For more information on PPE and its use in schools visit the CLEAPSS website at www.cleapss.org.uk. Safety glasses or goggles protect your eyes against being struck by foreign objects, chemicals or liquids. Goggles usually cover more of the eye area and often provide a tight seal ensuring that nothing can enter the eye from around the lens area. Safety glasses often look like standard glasses but have plastic side panels providing further protection. Full face shields are also available which resemble welding masks. These offer protection to the whole face area and offer less viewing restriction than glasses or goggles. Two types may be used in schools; ear defenders and ear plugs. Ear defenders are full over-the-ear cups filled with sound absorbing materials. They are often large and bulky but provide the best protection against loud noises. Ear plugs are usually small foam or plastic devices which fit inside the ear blocking out as much sound as possible. They are often disposable but can be uncomfortable if used daily. Both types not only protect against loud sounds but also may prevent foreign bodies or dust entering the ear. Several types of gloves may be used in schools. Disposable latex, nitrile or vinyl gloves are often used to provide a physical barrier when handling chemicals or toxins, using detergents or from biological hazards. To protect against heat or fire, gauntlets or welder's gloves are often used. These are usually made of heavy fabric, Kevlar or leather and are often used when handling hot metals, glassware or operating autoclaves. Heavy knit gloves may be used for general hand work such as moving equipment or handling glass. Lab coats are an important component of PPE as the coats provide a barrier againts chemicals, biological hazards, stains and grime. 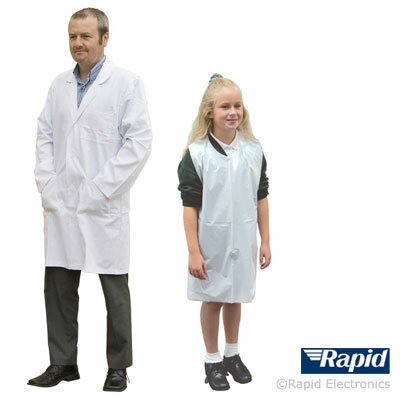 As a rule, poly/cotton blend Lab coats have the ability to shed liquids much better then 100% cotton coats as the cotton will absorb liquid associated more readily then the poly/cotton blend. Labcoats should be of a good fit, should be washed reqularly to remove contaminents and replaced if damaged or badly worn. Aprons prove another type of body protection and are often used by students. Two main types are often used; fabric versions and plastic wipe-clean types. Both have their merits but the wipe clean types are much safer when handling hot liquids as the fabric type may absorb the liquid and hold it against the skin rather than repel it. Disposable plastic aprons can provide temporary protection from liquids and grime and provide a cheap way of protecting clothing. Always ensure the instructions that come with PPE are followed exactly and the PPE is used only for its intended purpose by a competent person.